Sat. 23rd March from 8:30 a.m.
Nearly 300 gymnasts including athletes from Barbados, the USA and, for the first time at We Flippin', gymnasts from St. Vincent & The Grenadines! Tots & Tumblers is located at #31 Dundonald Street in Port of Spain, Trinidad. We are located on the same compound as Standard Motor Supplies. From the Savannah - turn onto Dundonald Street, (Haagen Daz is at the top of Dundonald Street - before TGI Fridays). We are on the right hand side after New Street. ​From Port of Spain - access Dundonald Street from Gordon Street. We are on the right hand side after New Street. ​We are pleased to offer on-site parking. ​If our facility is full, you may utilise the public car park located on the corner of Oxford & Edward Streets. This car park is secure and is only a short walk away from us. Be aware if you park on the street, as the wrecker is active. Tots & Tumblers Gymnastic Club opened in April 1999 and has gone from strength to strength. 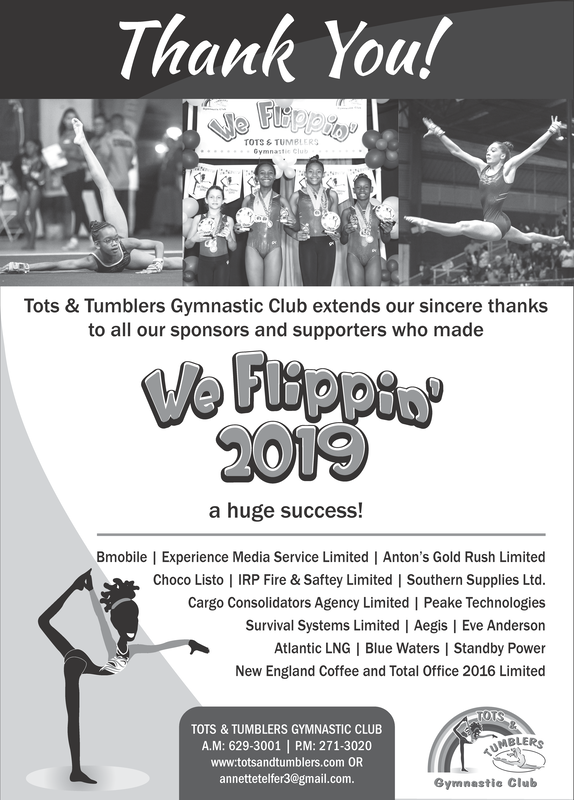 We saw the need for a permanent gymnastic facility in Trinidad & Tobago and in April 1999, Tots & Tumblers came into being. Our programme is all-inclusive, with a variety of classes for both Recreational as well as Competitive gymnasts. Since its inception, Tots & Tumblers has offered a comprehensive gymnastic programme, through which children of all ages develop both physical and social skills. Exposure to gymnastics, which is considered a foundation sport, contributes to a child’s development of co-ordination, strength, flexibility, balance, self-confidence and a sense of achievement. We are an innovative organisation with numerous accomplishments. Indeed, we are the only club in Trinidad & Tobago to have produced gymnasts who have represented Trinidad and Tobago at an elite level. It all began when Annette Telfer was handed the reins of the gymnastics programme at St. Andrew’s School. At this time, she had 8 gymnasts, very little equipment, not much experience and no coaches, but she did have a vision and passion. Over the years, with the support of the school Principal, Miss Angela Agarrat, the programme grew from strength to strength. We were joined by coaches Deborah Knowles-Garcia, Clifton Mc Dowell and Michelle St. Louis, all of whom have grown and developed with us and remain, to this day, our core team of coaches. They have proven themselves to be an indomitable combination. St. Andrew’s Gymnastics truly pioneered the sport in Trinidad and Tobago, laying many of the foundations on which gymnastics in our country is based. A small team of gymnasts created history when they competed abroad in Florida, USA for the very first time in 1996. The trip was a great success and we have never looked back since.